The expanding British Empire and improving manufacturing techniques created an immense amount of commerce during the 17th and 18th centuries compared with previous times. 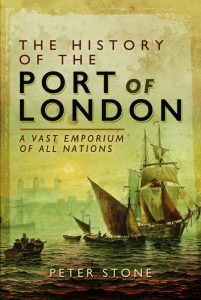 Trade with the colonies and other parts of the world was such that congestion in the Port of London reached a new peak, even at the time that the nation was engaged in the Napoleonic Wars when almost the entire Continent was closed to British shipping. Yet due to ancient regulations, created at the beginning of the reign of Queen Elizabeth in the 16th century in order to ensure efficient collection of customs duties, all imports landed at London were obliged to pass through a small number of ‘Legal Quays’ between London Bridge and the Tower of London within the City. By the latter part of the 18th century this had created a troublesome bottleneck. Hundreds of ships lined up along the centre of the river at any time waiting to unload at the quays, a process that could take weeks. When it was their turn cargoes were offloaded from the ships onto lighters, to be transported up the river to a wharf where duty could be paid. As ships waited to unload a significant proportion of cargo was stolen by gangs that preyed on the unguarded moored vessels. Goods standing on crowded and chaotic quaysides were also at risk from criminals, sometimes in collusion with customs officers. The magistrate, social reformer and statistician Patrick Colquhoun published his Treatise on the Police of the Metropolis in 1796 in which he proposed the creation of a police force for London. He was introduced to John Harriott who, understanding the scale of criminal activity on the river, proposed a specialist force. That led to the creation of the Marine Police Establishment, based at Wapping, the forerunner of London’s Metropolitan Police. The London insurer and Fellow of the Royal Society William Vaughan published a treatise On Wet Docks, Quays and Warehouses for the Port of London in 1793 describing the problems of congestion on the river. His solution was to create tide-free docks between the Tower of London and Blackwall. A petition was started. In 1796, under increasing pressure, particularly from importers of sugar and rum from the West Indies, Parliament formed the Select Committee for the Improvement of the Port of London, which included Prime Minister William Pitt, to consider the problem. Ideas were invited for reform of the port and eight separate schemes were considered. With many different groups of vested interests lobbying against the various ideas the Commons committee procrastinated for several years, accepted the general principal that new enclosed docks were the answer but did not back any specific proposal. At about that same time the merchant Robert Milligan, whose family owned a sugar plantation in Jamaica, brought together a group of investors at the Royal Exchange to form the West India Dock Company. Their intention was to create new facilities on the Isle of Dogs, the large peninsula opposite Greenwich where the Thames sweeps south downstream of London, at which merchants trading with the Caribbean could land their cargoes and store them in secure warehouses. Parliament passed the West India Dock Act in 1799 and it was the start of a new era for the Port of London. The Act gave the company the right to raise money to purchase land and create their own docks where customs duty could be paid, thus ending the two hundred and fifty year old monopoly of the City’s Legal Quays. In return for their investment the merchants were given a twenty-one year monopoly on goods shipped to and from the West Indies to London. The Isle of Dogs was at that time mostly open meadow-land where cows were grazed, with ship-breakers’ yards, rope-makers and timber merchants along the riverside. The civil engineer William Jessop, who was also responsible for the Grand Junction Canal from the Midlands to London, was commissioned to create the docks and warehouses. He in turn left much of the work to Ralph Walker, one of those who had originally proposed the docks. The Scottish engineer John Rennie acted as a consultant and he introduced steam power for both the construction work and the dockside cranage. Two massive basins were constructed lying side by side in parallel in an approximately east-west direction. The one to the north covered thirty acres and was for ships arriving with imports from the Caribbean, while the southern dock was of twenty four acres and used by ships loading with exports. Large locks connected them with the Thames allowing ships to enter and leave during high tides. Nine huge warehouses flanked the basins, capable of storing the entire annual import of sugar.